But once in a while, under just the right conditions, you get something entirely new: a futuristic alloy called metallic glass that's amorphous, with its atoms arranged every which way, much like the atoms of the glass in a window. Its glassy nature makes it stronger and lighter than today's best steel, plus it stands up better to corrosion and wear. The research group took advantage of a system at SLAC's Stanford Synchrotron Radiation Lightsource (SSRL) that combines machine learning — a form of artificial intelligence where computer algorithms glean knowledge from enormous amounts of data — with experiments that quickly make and screen hundreds of sample materials at a time. This allowed the team to discover three new blends of ingredients that form metallic glass, and to do this 200 times faster than it could be done before, they reported today in Science Advances. "It typically takes a decade or two to get a material from discovery to commercial use," said Northwestern Professor Chris Wolverton, an early pioneer in using computation and AI to predict new materials and a co-author of the paper. "This is a big step in trying to squeeze that time down. You could start out with nothing more than a list of properties you want in a material and, using AI, quickly narrow the huge field of potential materials to a few good candidates." The ultimate goal, he said, is to get to the point where a scientist could scan hundreds of sample materials, get almost immediate feedback from machine learning models and have another set of samples ready to test the next day — or even within the hour. Over the past half century, scientists have investigated about 6,000 combinations of ingredients that form metallic glass, added paper co-author Apurva Mehta, a staff scientist at SSRL: "We were able to make and screen 20,000 in a single year." The team said the method will be useful in all kinds of experiments, especially in searches for materials like metallic glass and catalysts whose performance is strongly influenced by the way they're manufactured, and those where scientists don't have theories to guide their search. With machine learning, no previous understanding is needed. The algorithms make connections and draw conclusions on their own, and this can steer research in unexpected directions. Founded by former graduate students from Stanford and Northwestern universities, Citrine has created a materials science data platform where data that had been locked away in published papers, spreadsheets and lab notebooks is stored in a consistent format so it can be analyzed with AI specifically designed for materials. "We want to take materials and chemical data and use them effectively to design new materials and optimize manufacturing," said Greg Mulholland, founder and CEO of the company. "This is the power of artificial intelligence: As scientists generate more data, it learns alongside them, bringing hidden trends to the surface and allowing scientists to identify high-performance materials much faster and more effectively than relying on traditional, purely human-driven materials development." Until recently, thinking up, making and assessing new materials was painfully slow. For instance, the authors of the metallic glass paper calculated that even if you could cook up and examine five potential types of metallic glass a day, every day of the year, it would take more than a thousand years to plow through every possible combination of metals. When they do discover a metallic glass, researchers struggle to overcome problems that hold these materials back. Some have toxic or expensive ingredients, and all of them share glass's brittle, shatter-prone nature. Over the past decade, scientists at SSRL and elsewhere have developed ways to automate experiments so they can create and study more novel materials in less time. Today, some SSRL users can get a preliminary analysis of their data almost as soon as it comes out with AI software developed by SSRL in conjunction with Citrine and the CAMERA project at DOE's Lawrence Berkeley National Laboratory. "With these automated systems we can analyze more than 2,000 samples per day," said Fang Ren, the paper's lead author, who developed algorithms to analyze data on the fly and coordinated their integration into the system while a postdoctoral scholar at SLAC. SSRL is a DOE Office of Science user facility. In addition to SLAC, NIST and Northwestern, scientists contributing to this study came from the University of Chicago's Computation Institute, the University of South Carolina and the University of New South Wales in Australia. 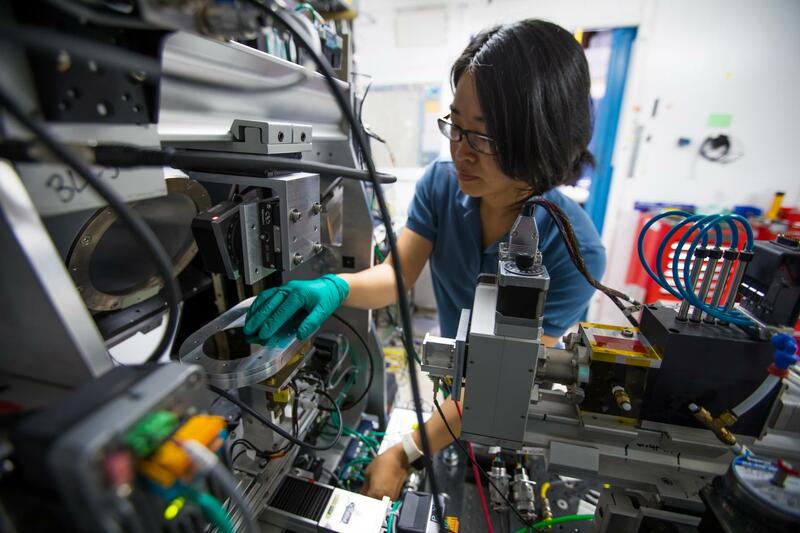 The SLAC pilot project with Citrine is funded by the Advanced Manufacturing Office of DOE's Office of Energy Efficiency and Renewable Energy, and includes collaborating scientists from NIST, DOE's National Renewable Energy Laboratory and the Colorado School of Mines. The CAMERA project at Berkeley Lab is supported by the DOE Office of Science.